1st ODI New Zealand vs India: India skipper Virat Kohli was in high spirits after the Men in Blue beat New Zealand by eight wickets at Napier to take a 1-0 lead in the ongoing five-match ODI series. 1st ODI New Zealand vs India: India skipper Virat Kohli was in high spirits after the Men in Blue beat New Zealand by eight wickets at Napier to take a 1-0 lead in the ongoing five-match ODI series. 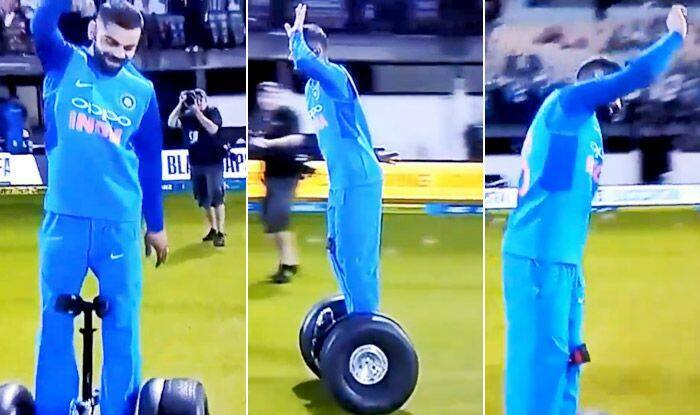 After India’s clinical victory over Kiwis, Kohli was caught trying his hands on the hoverboard and thanked fans while doing it. Just like his batting, Kohli showed no signs of nerves while operating the machine and handled it like a pro, He showed he was good at it as he operated it like a pro. Kohli and the entire team, whoever was present was egging on the India captain as he briskly went about impressing fans. It seemed like Kohli was doing an iconic Dharmendra step while on the hoverboard. Kohli recently bagged three major awards at the ICC awards function. Kohli became the first player in history to win the Sir Garfield Sobers Trophy for ICC Cricketer of the Year, his second consecutive, the ICC Test and the ODI Player of the Year awards following an extraordinary 2018. The 30-year old scored 1322 runs at an average of 55.08 with five centuries in 13 Tests and 1202 runs at an astounding average of 133.55 with six hundred in 14 ODIs saw him selected to both sides by every voting member of the Academy, with a majority of them also opting to name him at the helm of each.